Working with interns in this day and age can be a challenge. The mindset of many interns that I’ve had the experience working with over the last few years is more about how much time off they will have vs. asking for more opportunities to learn. A strong work ethic, in a fast-paced world of social media distractions, is rare. I was lucky to find Taylor Young just about a year ago and she has proved to be luxury find. It’s important to know people behind the face of any publication, and next month, we’ll be introducing you to the man who gives our digital magazine its style and design, Benjamin Bennett. For now, let’s talk with Taylor and find out what makes this young lady tick. Taylor came on as an editorial intern with my book publishing consultancy, and we were just getting Luxe Beat Magazine up and running. She took to the work and diligently worked through a variety of projects. As the magazine began to grow and gain traction, so did Taylor. She’s now part of our editorial team and has the roll of Production Editor, in addition to helping produce our Luxe Beat Lifestyle Radio show, as our Assistant Radio Producer. The prep work that goes into publishing a magazine is incredible. Our writers submit their articles and then they are off to the editorial department where they are reviewed and edited by 2-3 different sets of eyes. At that juncture, as Editor-in-Chief, I will review the edited article, make any tweaks to copy or photographs, title, etc. and then schedule that article for online publication and our digital magazine. It’s at this juncture that Taylor takes over and gets the content ready for our Creative Director, Benjamin Bennett, to work his design magic. There is prepping the content, linking to photographs, adding any audio or video files to each article to make it as seamless as possible for the design team to convert the content into magazine form. There is always follow-up with writers if we’re missing anything. When we’re not working on the digital and online publications, there is our radio show. Taylor is new to the radio game, but catching on quickly. We’re in pre-production right now, and she is responsible for managing the board, coordinating guests and will ultimately be handling the final production of each show. 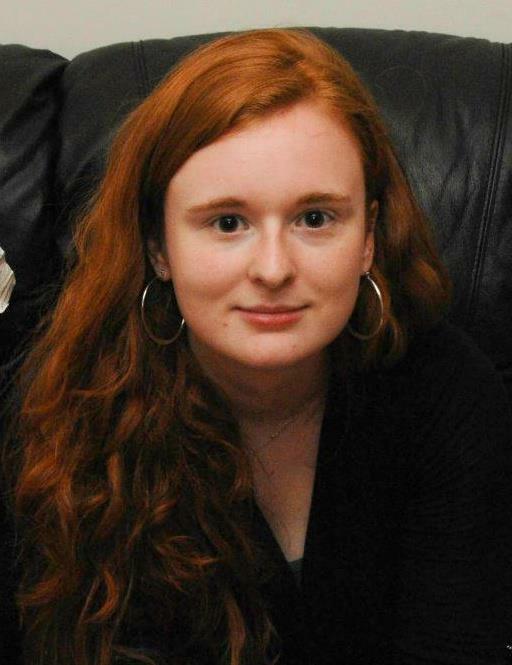 Taylor is currently a senior at Western Carolina University, pursuing a degree in English with a professional writing concentration. She has an enthusiasm for classic literature and editing all types of work. She pulls from her own experiences in her writing and likes finding facts to support any claim she makes. She is a freelance writer who has been published via Author’s Boutique™, PubSmart™, Whereandwhatintheworld.com, and Luxe Beat Magazine. Interestingly, Taylor has an interest in the paranormal and when given the opportunity to work on Paranormal Galaxy Magazine, which is another magazine I publish, she was ecstatic. She is not only Production Editor, but also designer. She was born in Charleston, SC, and her family moved around quite a bit when she was younger. Then, her family settled in New Bern, NC, and she stayed there until her sophomore year in high school when she moved to Chapel Hill. She has a passion for travel which makes her a perfect fit with Luxe Beat. It has always been something I’ve enjoyed. My Great Aunt Marti was elemental in encouraging that side of me. She took me to Washington, D.C., and then my first trip overseas to London. These two trips influenced my love of travel, not to mention the many road trips I have been on with my mom over the years, and mission trips I have taken with my church. I don’t think I’ll ever get over the excitement traveling can provide. My writing process is very academic in nature, simply because I’ve had to write a lot of papers for my college classes. Research is where I typically start the creative process. One of the lessons I have learned is that if you don’t have any outside source as a reference point, you cannot be considered credible. Of course, this does exclude personal accounts of events, but for most forms of writing, it’s helpful to see what other people have written on the subject. Putting together an outline is preferable when I have time. My brain can sometimes run faster than my hands can write, so it’s helpful for me to have all of my thoughts loosely written down ahead of time. Personally, I like to revisit places I’ve been before. London is on my list, along with Charleston, and I wouldn’t mind taking a big kid trip to Disney World. As for places I’ve never been to before, I’d love to travel all over Europe and perhaps visit some of the United States that I haven’t seen before. What is one of your favorite experiences while traveling? There are so many experiences to choose from, but one that sticks out in my mind is our walk around tour of Westminster Abbey in London. I thought it was one of the most beautiful churches I have ever seen; it was certainly a lot different than Protestant churches I am used to. There was so much history there and I loved how the sunlight was filtering in the abbey through the windows, making it a bright place. 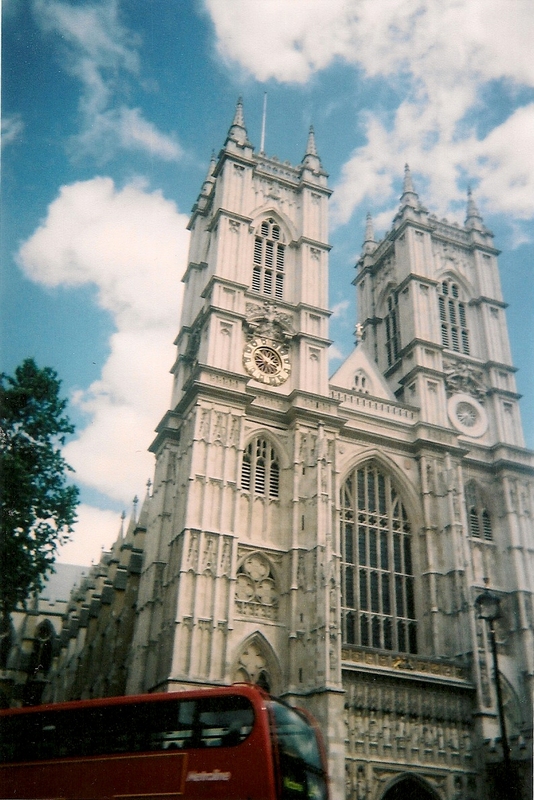 One of the best pictures I ever took was of the exterior of the abbey; I timed it perfectly and got the top of a double decker bus in the picture! I was excited when the film developed. Spending time with my friends is top of the list. We watch movies, share meals together, work together on volunteering with the church, and occasionally, we take our own small trips to fun places near our college. As for hobbies, I don’t have much time for them while in school, but I do enjoy reading, playing the occasional video game, and catching up with my favorite TV shows, including Doctor Who and Once Upon a Time. Ideally, I would have the Doctor and his TARDIS, so I could just get off the island in a flash. But since that cannot happen, I would bring my best friend, a knife, a big pitcher that filters its own water, and a light that flashes so obnoxiously at night that it signals half the planes and helicopters in the sky. Tell us about your hometown and how you might entertain us on a visit? New Bern, NC, is definitely a great place to see historic attractions from colonial America. Since it sits where two major rivers meet, it was the original capitol of North Carolina. The governor at the time built Tryon Palace, which is the most popular home to tour in downtown New Bern. There are also plenty of other gorgeous historical homes to see near and around Tryon Palace. The next most notable thing about New Bern is that it is the birthplace of Pepsi, and there is a restaurant called The Chelsea, located where Pepsi was first formulated. Across the street from The Chelsea is a store that sells Pepsi regalia and souvenirs. There are also fabulous seafood restaurants in downtown New Bern, since it is only an hour from the beach. Captain Ratty’s Seafood features a great rooftop setup that looks over the rivers. New Bern is certainly a historic small town to visit and take in breezy riverside weather. Sunscreen, unless I decide I want to turn into a lobster. I always like to bring along some form of music to listen to on the way to the destination or to just add to the relaxing atmosphere. Finally, I like to bring a book in case there is some downtime between seeing sights and going out to dinner. Luxe Beat is definitely a publication that shows off the beauty of this world that sometimes people forget or don’t know exists, and that is my favorite part of this magazine. Its articles have definitely given me a peek into another type of lifestyle, and I have definitely got some new travel ideas that I have added to my wish list. What else do you do in addition to managing the production of Luxe Beat Magazine? I design Paranormal Galaxy Magazine and manage all content for the magazine and its website. On “Paranormal Galaxy Radio,” I do a weekly Paranormal Pop Culture Update during the second half hour of the show. In the works is “Luxe Beat Lifestyle Radio,” which is an online radio show for which I am Assistant Producer. I am a full time student, and I also take time to volunteer for my church and community whenever I can.